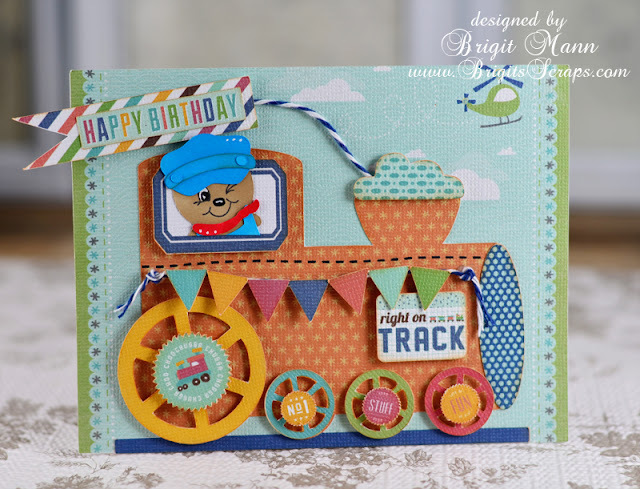 Brigit's Scraps "Where Scraps Become Treasures": Choo Choo Birthday! I thought this card would be so cute to enter the Scoot challenge over on Echo Park's Facebook page. I used the Santa's Train from SVG Cuts and also one of Jonathan's Bears. All the other elements are from the Scoot collection, it's really such an adorable collection, perfect for little boys! I also used some In the Navy Trendy Twine and a Peachy Keen Face Stamp. OMG Brigit!! This is so adorable!!!! I LOVE the colors and that adorable PK face! GREAT boy's card!!! Thanks for sharing another awesome project!!! This card is just too adorable!!! I'm going to have to grab it from svg cuts! LOL! Hi, Briget! Dropping by to hi after being away from blogland for a while. I'll be back to visit again soon! SVGCuts New Kit Egg Hunt! Trendy Twine February Guest Designer!